Earth Safe Environmental General Contracting. They are professional and reasonably priced. They have done extensive work on my home and I've been happy with all of the workmanship and the business dealings. Personally, I think hard scalping is time consuming but relatively easy if you are patient. I would highly recommend Skyview Landscapes. Always professional, good prices. I found Trevin Peterson through an All Over Albany recommendation about 2 years ago. My situation: Last autumn, Trevin was one of the only contractors who was ready to thoroughly discuss the causes of patio failures here in Rensselaer County with it's difficult moving clay and cobblestone soils, particularly with the hillside slopes around home. He has been doing 'hardscaping' since he was 16, assisting his dad. His quotes were better detailed than other contractors. This spring, the job scope actually grew considerably since I decided this contractor was capable of replaceing 40 year old deteriorating retaining walls with architectural block here at my hillside home, along with an old side entrance deck supported by rotting cantilevered joists. Everything came out looking very professionally well done. He is partnered now with a master carpenter Chris Urba, and the company is now called Built By Design - trevin@builtbydesignllc.com 518-229-3711. They will not be your cheapest quote, but if you want expert work they have the experience. I say you DIY it. I'm tackling the same type of project right now. Never done it before, but it's not too difficult to do on your own if you do your research. 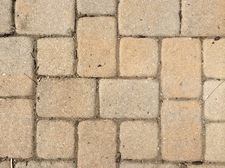 Our patio will be 300 square feet, made out of cobblestones weighing 25-40 pounds each. We are also putting up a shed and a fence, and have finished a retaining wall like you said. My wife and I both have day jobs, but it will definitely all be done this summer working on the weekends. For this and other projects, I've found the DIY route to be less frustrating than dealing with contractors, plus it's more rewarding and cheaper. http://www.stoneandlandscape.com/ - DL and his crew will do a great job. They have been in the area in the business for decades and do great work. I agree with Tim - I also found Trevin through an AOA recommendation and had him install a patio in my backyard last summer. He was very responsive, hard working, and professional and the patio came out great! I would definitely recommend him. Northern lights landscaping is creative, durable and time-tested. Faddegon's did our entire backyard for us, including patio and hardscape and it was a very pleasant experience. The crew was super nice and easy to work with and they stand by their product...we had a couple of repairs required after ground settled etc. and they did not leave us hanging. You may pay a little more, but the professionalism was worth it to me.